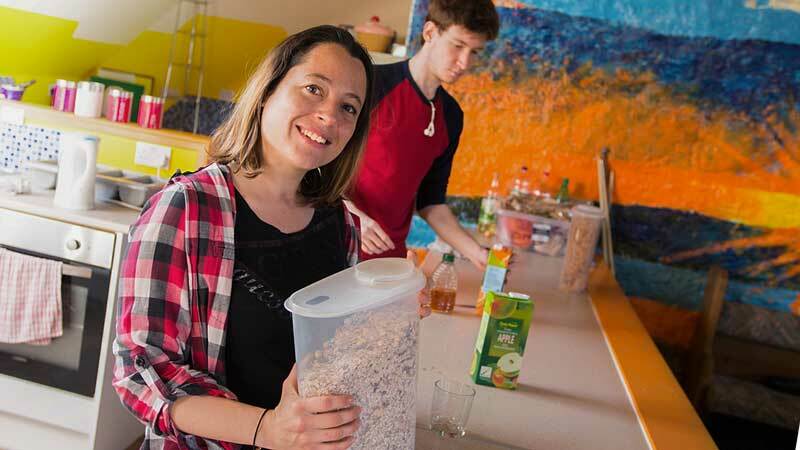 The best value dorm accommodation in Oban's favourite hostel. The comfiest dorms in Scotland? - you decide! 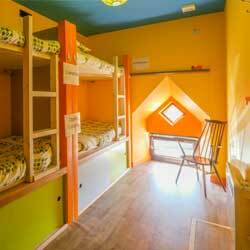 Budget dormitory accommodation in Oban, Scotland. Big comfy bunk beds with sheets and duvets. Warm and cosy dorms. Spacious lounge area with pool table. Backpackers Plus is in the centre of Oban, just a short 10 minute walk from train, bus and ferry terminals. Fully equipped kitchen and large dining area. Light buffet breakfast included. Enjoy our fantastic and unique Sky Room lounge with views over Oban's rooftops - and the comfiest sofas you'll find. Car parks and on-street parking are available near to the hostel - with Pay & Display charges until 6pm, then free overnight until 9am. The closest off-street car parks are at Corran Halls and Atlantis Leisure Centre (both under 5 minutes walk away). The hostel has inside storage for bicycles. Reception is open for enquiries from 8am to 10.30am and from 4pm to 10pm. Check-in is from 4pm to 10pm. 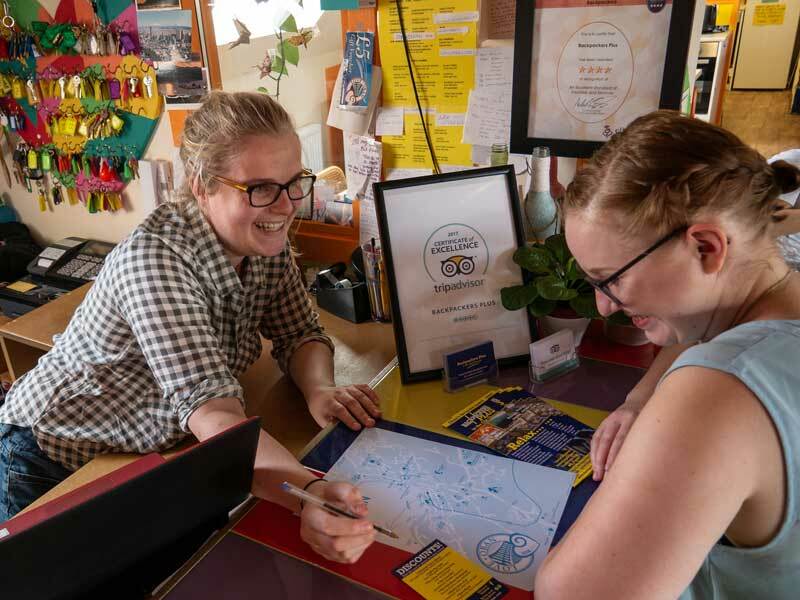 If you need to check-in later than 10pm, you must notify us in advance by emailing info@backpackersplus.com or calling 01631 567 189 during Reception Hours. 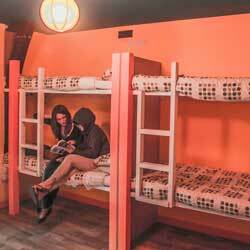 We’ve probably got the widest, most comfortable, spacious bunks in any hostel across Scotland! Custom made for Backpackers Plus, these are not just a place to sleep - they are a wonder to behold! 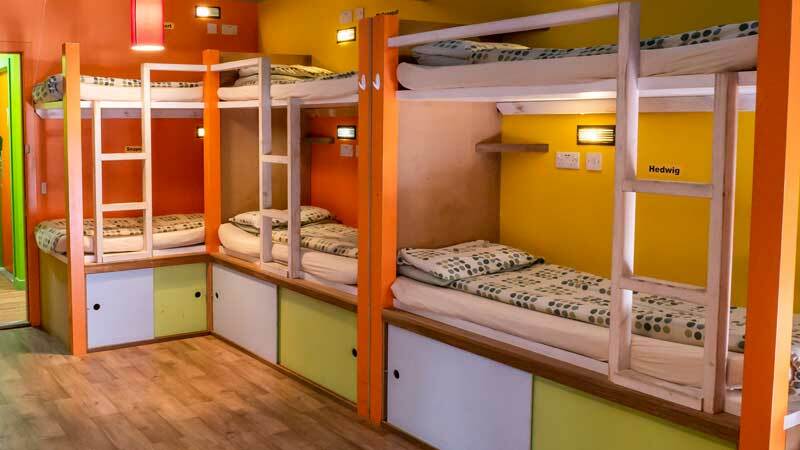 Each bunk has a super comfortable mattress with fitted sheet, lovely duvets and two pillows. 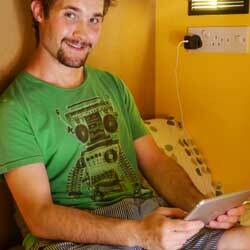 There's your own reading lamp, shelf and two electrical socket outlets for powering your phone, music player or whatever. The hostel showers are awesome with lots of hot water (and yes, since you ask, there are separate facilities for women). 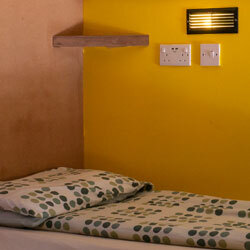 The hostel has full central heating so you're warm and cosy whatever the weather outside. Plus we offer a laundry service and if you need to hire a towel just ask for one at reception when you arrive. There’s a fully equipped kitchen for you to prepare your own food. Whether you simply want to make a sandwich or cook a hot meal you are free to make use of the cooker, microwave, fridge, pots/crockery and plenty of hot water for the washing up afterwards. Relax in the communal dining area and help yourself to free tea, coffee or hot chocolate. And of course you are free to enjoy the Sky Room lounge in the main hostel building - watch the sun go down over the rooftops of Oban. Help yourself to hot drinks, juices, cereal, bread/toast from from 7.30am - 10.30am – it will set you up for the day! Breakfast is included in the price. 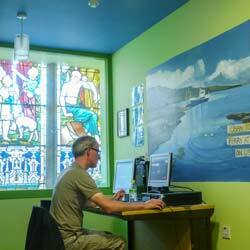 Our friendly, knowledgeable staff will welcome you to Backpackers Plus and to Oban. Whether you are staying for a day or a week, they will help you plan and get the most from your visit. The Backpackers Plus Sky Room lounge is a unique place to relax and meet other travellers. This huge open plan room features the exposed beams of the old church and a view over Oban's rooftops towards the sunset beyond Mull. There are comfortable seats where you can sit and chat, read a book or play a game of pool. Plan the next day’s activities and make use of our internet access and FREE WiFi. Chat the night away, challenge new friends to a game of pool or simply read a book or pore over local maps. Friendly, knowledgeable, here to help!